How Do I Choose a Toilet? Home / Lakewood Ranch Plumber / How Do I Choose a Toilet? How do I choose a toilet? For a homeowner this can be an overwhelming concern. If you are shopping for a new toilet, it is because yours is old, broken, doesn’t flush well or you want a new color to fit your new bathroom. When you walk into a big box store to shop for toilets, they will carry about four different brands. And the brands will have three to four models between them. That is a lot of choices! Do you just ask the $10.00 an hour guy which one is the best? How would he know? Do you just pick one by the price? Do you pick a toilet because you like the seat that it shows it comes with? Would you just get overwhelmed and pick a brand you know? Years ago, there was a tire commercial that the guy would always say, “Tires aren’t pretty”, just so he could sell you some tires. Well most people want their toilet to have some style to it. But what everyone wants is their toilet to flush the first time, with-out any hesitation and no swirling around and around. Most people do not like it if their toilet sounds like a fighter jet taking off. How is the $10.00 guy, in the big box store, going to know how the toilets he is showing you, functions? Toilets today use 1.28 – 1.6 gallons of water. Different companies have different engineers that design them. Some work a whole lot better than others, and it doesn’t necessarily have to cost the most. A toilets job is to evacuate everything that is in the bowl. With 1.6 gallons of water, it can be done. However, that same 1.6 gallons of water is supposed to carry down your sewer line without leaving wads of paper and material behind. Plumbers in Sarasota, such as Wimpy’s Dependable Plumbing, sees all the different brands and models of toilets on a daily basis, by being a plumbing repair specialist. Wimpy’s recommends and installs Gerber Avalanche toilets. They have style, flush better than any other toilet on the market, and have standard parts inside that won’t cost a fortune to replace, when they need repair in the future. Wimpy’s can also evaluate your sewer line, with our sewer camera, to let you know if changing your 3.5 or even 7.5 gallon toilet will cause stoppages. 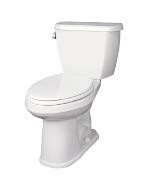 Call Wimpy’s, 941-322-1911 and we will talk to you about toilets. Or schedule an evaluation on line, at www.Loveyourplumber.com. Wimpy’s wants to make sure you are happy with your plumbing choices.